Cincinnati, OH — An ambulance responded to a medical emergency at the Mt. Auburn Health Center Planned Parenthood abortion facility in Cincinnati, Ohio, on Thursday, July 27, 2017. An emergency radio dispatch recording, obtained by Operation Rescue, indicated that a 20-year old pregnant woman was suffering a seizure. A fire unit, Engine 32, and Medic 3 (ambulance) were dispatched to the Planned Parenthood facility located on Mt. Auburn Avenue. According to witnesses on the scene, the fire unit was first to arrive at 10:36 a.m., followed three minutes later by the Medic 3 ambulance. After about 10 minutes, a conscious woman was brought out on a gurney and loaded into the ambulance for transport to a nearby hospital emergency room. This is the twenty-sixth medical emergency at a Planned Parenthood abortion facility that has been reported to Operation Rescue so far in 2017 – already far ahead of the Planned Parenthood emergencies recorded in 2016 when there were 28 emergencies reported over the entire year. The facility came under fire for not having a valid hospital transfer agreement, a requirement for licensing as an Ambulatory Surgical Facility in Ohio. Last year, the Ohio Department of Health issued Planned Parenthood a new ASF license after it dropped earlier efforts to revoke it. That license expired on May 31, 2017. Nevertheless, Planned Parenthood continues operating — and placing the lives of women in danger — with the expired license. 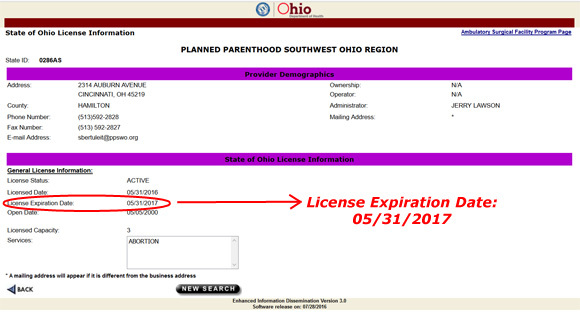 This screenshot of Planned Parenthood’s facility license page shows they have been operating on an expired ASF license. “Given that this facility was operating under an expired facility license at the time of the emergency, this Planned Parenthood should be closed pending a thorough review by the Department of Health,” said Newman. A 911 recording obtained by Operation Rescue gave details of a very similar medical emergency at the Cincinnati Planned Parenthood in 2015. Other medical emergencies at that facility were discovered in Ohio Health Department documents leaked to Operation Rescue. In November 2016, Operation Rescue reported on a number of visits made by the city sewer department to the Planned Parenthood abortion business, which was experiencing backed up drains – a problem that has since persisted.